Glo is currently offering it's users up to 16gb worth of data free when they buy the Glo 4G Modem which cost just N16000. Glo claims the 4G MiFi offer is as good as being given out free of charge, considering the worth of the free data bundle. "You will get the 16GB and it will be spread over 12 months”. A further advantage of the Glo 4G MiFi is the power of Glo’s 4G network which comes with high speed internet service backed up by Glo1, the company’s transatlantic submarine cable." 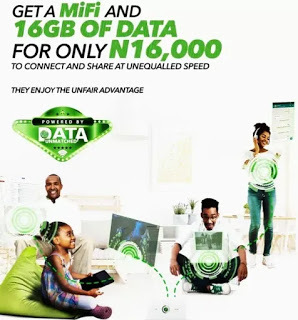 If you have a good Glo network reception in your area then you might want to consider this offer as it lets you take advantage of the Glo 4G speed and you can connect up to 15 Wi-Fi devices at the same time including your smartphone, laptop, tablet and more. So if you will like to try out the 4G network and enjoy the free data, then just walk into any Glo office near you to get yours.